When Marzieh Hashemi – born Melanie Franklin – traveled to the United States to visit her family, she was immediately arrested by the FBI at St Louis Lambert International Airport, then transferred to Washington DC. CAIR The Council on American-Islamic Relations (CAIR), designated a terrorist organization by other Arab Muslim nations, today called on the U.S. Department of Justice (DOJ) and the FBI to explain why a detained American citizen who is a long-time anchor on Iranian television – Press TV – is allegedly being denied religious rights while held on unspecified grounds. 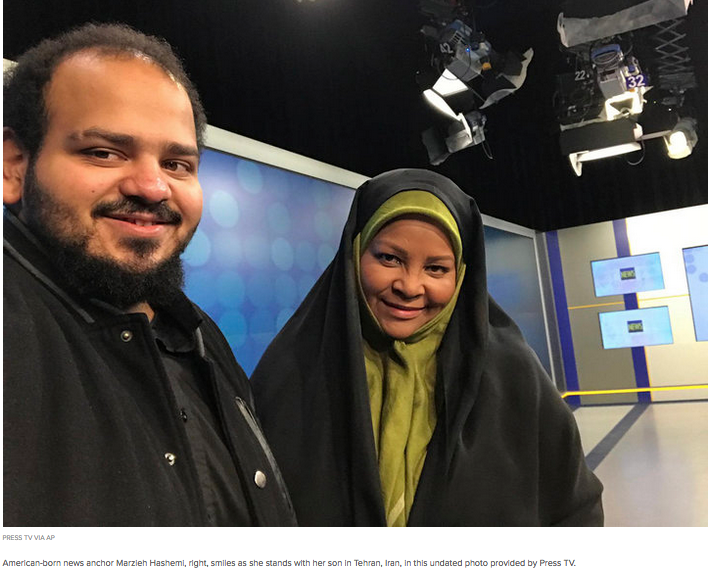 Marzieh Hashemi, an anchorwoman on Iranian state television’s English-language service, was arrested by the FBI during a visit to the U.S. Her son said she was being held in prison, apparently as a material witness. Reports indicate that Hashemi was detained in St. Louis and then taken to Washington, D.C. Her current location is unknown. Family members say she is being denied the right to wear her Islamic head covering (hijab) and is also being denied pork-free meals. The FBI told the Associated Press it has no comment on the arrest. New York Times The reported action, which has not been confirmed by the American authorities, was condemned by Iranian officials. 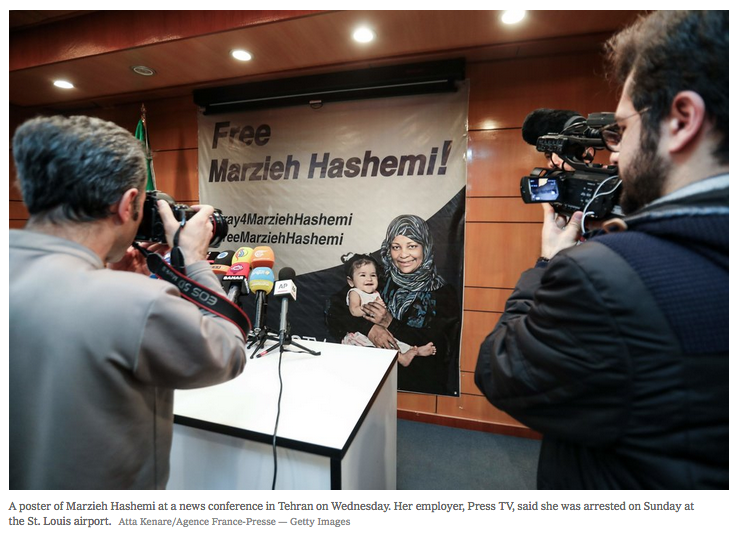 The journalist, Marzieh Hashemi, who has lived in Iran since 2009, is an anchor at the channel, Press TV. It said that Ms. Hashemi, 59, was arrested at the St. Louis airport on Sunday and transferred by the F.B.I. to Washington, where she remained in custody. No charges have been filed against her, the channel said. Ms. Hashemi’s family said in a statement that no reason had been given for her arrest. They said that her Islamic head scarf had been forcibly removed, that she was chained hand and foot, and that she was being denied access to halal food and had eaten only crackers. Bahram Qassemi, a spokesman for the Iranian Foreign Ministry, said the arrest highlighted the “racist (what “race” is Islam?) and discriminatory” policies of the Trump administration. 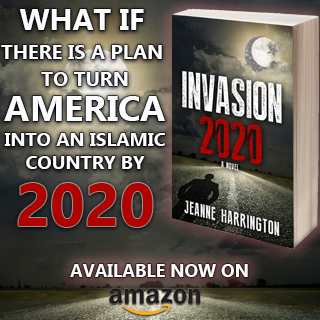 Ms. Hashemi was born Melanie Franklin in New Orleans and converted to Islam. She has long publicly supported the 1979 Islamic Revolution and is married to an Iranian. Ms. Hashemi is one of the main anchors at Press TV, which was established by Iran’s state television to spread the country’s message around the globe. 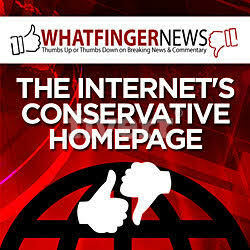 It is a part of a powerful state media organization that is widely seen as a tool of the country’s hard-line factions. 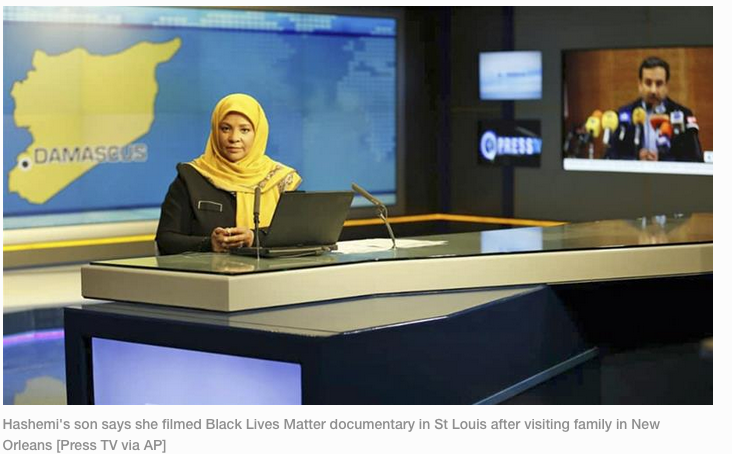 The station has featured interviews with Western analysts often critical of their own governments, and Ms. Hashemi has filed reports on discrimination against women, Muslims and African-Americans in the United States. Foreign Minister Mohammad Javad Zarif condemned the arrest as a “violation of freedom of speech and unacceptable”. (Or so says the world leader in NO freedom of speech) “She is the wife of an Iranian citizen and we see it as our duty to defend the rights of our citizens,” Zarif told Iran’s Arabic-language state broadcaster Al-Alam news channel. Cassy, every guest she has on, and many of them are far-left Americans and English-speaking Europeans, hate America, hate Israel and everything they stand for. She’s as big a tool for the mullahs as any of them. “She is the wife of an Iranian citizen and we see it as our duty to defend the rights of our citizens,” I wonder what ‘right’ of their citizen has been violated by the arrest of this creature? The right of their citizen to boink this pig? Is it even conceivable that any man would even be interested in her? She is an US citizen, and in our country EVERYBODY has rights, including the right to habeus corpus, so let the vermin husband of hers file a petition in a US court to produce her before the court. I had hoped that the Trump administration would have destroyed cair by now. Guess I was wrong. DO NOT allow this person to hide behind ‘religion’. Its a worn out phrase any person with common sense can see thru. How dare the US do this? Only Iran is allowed to do this kind of thing! They said that her Islamic head scarf had been forcibly removed, that she was chained hand and foot, and that she was being denied access to halal food and had eaten only crackers. No halal nor head scarf? Only crackers? The inhumanity of it all! Imagine the horrors in American detainment for these poor (?) muzslimes. What next …no first-rate legal defense at tax-payer expense? Certainly, Axis of Evil nation states would NEVER deny captives such essentials. 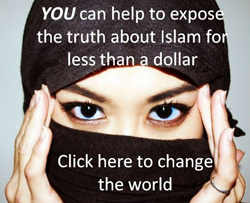 That traitorous convert was likely only assisting Allah in jihad. How dare we deny her any, and all, comforts while she contrives our demise with her fellow combatants?